Vinyl as notebook, notebook as vinyl. The legendary notebook and hipster cahier of choice Moleskine have unveiled an ambitious new hybrid version of the their famous pads in celebration of Italian writer Italo Calvino. Crammed with multi-disciplinary material from a host of worldwide creatives who’ve no doubt honed their ideas in many a tattered Moleskine themselves, Canzoni Invisibli or Invisible Songs collects 60 pages of visual art, dance, film, electronic music, jazz, song-writing, poetry and illustration in the lush special edition. 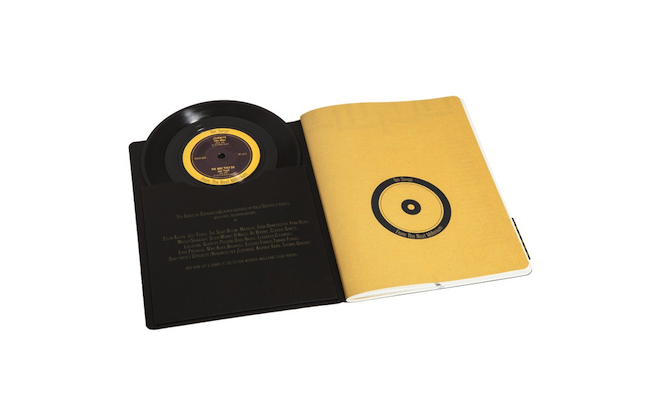 The beautifully designed pocket book also includes a 10-track 7″ vinyl entitled “Ten Songs From The Next Millenium” featuring contributions from a host of musicians and producers from a range of backgrounds that include Berlin techno label BPitch Control founder and producer Ellen Allien. With a free 12″ vinyl of bonus material given away with the first 500 copies, you can order here.